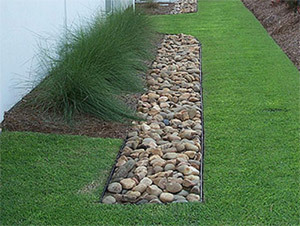 The performance of the trench depends largely on the permeability of the soil and the depth to the water table. Infiltration trenches usually serve small catchment areas up to 2-3 hectares in common with other source control techniques. The closer they are to the source of the runoff the more effective they will be. The operational life of the trench may be enhanced by providing pre-treatment for the inflow, such as a filter strip, gully or sump pit, to remove excessive solids. Regular maintenance will be required for most pre-treatment designs. View sites in Wales with a Infiltration trench system.